You have been looking forward to it as a Sims fan or maybe not, but The Sims Social is finally online! A new game for Facebook which already has a couple of thousand players! And one that can keep you busy for hours. 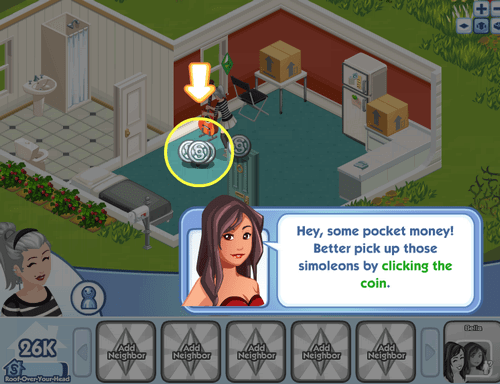 Pay attention: There is no Dutch version of The Sims Social, so I played the game in English. Let me begin at the beginning, creating a Sim. Of course there aren’t as much clothing and hairstyles like in the ‘real’ The Sims 3. But still, there are quite a lot! There are eleven hairstyles, eight haircolours, two pages filled with different eyes, two pages with mouths, a few eyebrows and noises. And of course the most important thing: The clothing! There are a lot of option to be found there: skirts, jeans, bikini’s, PJ’s, socks and shoes. Almost everything your normal Sim has too. There is only one big but, the very first time you pick an outfit everything it free and available. 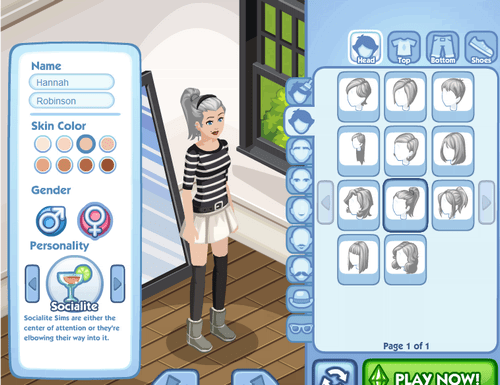 But when you want to change your outfit during the game, you’ll see more outfits and you need to pay for every item! Luckily, you will earn some money by doing assignments. Whenever you are finished with dressing your Sim, you will go to your new home. This house can be found in the town that goes by the name ‘ Little Haven’. The name says it all! Your place isn’t that big, you can only see your own house and that’s all! It would have been nice to see the houses of your friends instead of the green area’s. It would be extra fun if you could actually see their house grow. This will make you want to build more and more too. Once you are in Litle Haven, you will meet Bella Goth. She is a Sim which will appear in everyone’s game. I don’t know whether all the other Sims which are shown during te promo’s will be in the game, let’s hope so. Bella Goth immediately gives you a small tutorial on how to control your mood, how to earn money and how you can finish your neighbours. It’s not really hard to keep track. Your mood takes more time to run red compared to the mood meter in The Sims 3, but you will run low on money a lot. This because you have to buy certain items during certain assignments. It is quite easy to get items, as long as you have enough neighbours who are willing to help! Sometimes it is kind of annoying that you have to wait for items, but when you try to get them yourself you will run low on energy really quick. When you’re finally finished with Bella’s tutorial, you can explore the big World. Your house, I mean. During the tutorial you ned to open two boxes, these contain a computer and a microwave. But with what more can you cheer up your house? Well, I can tell you that there is enough! But unfortunately, certain items require SimCash, for which you have to pay. I, as a Dutch girl, do not like that! There is enough choice of Furniture: couches, chairs, tables, beds, decorations, items for skills like a easel and a scope. Basically it is the same as the items of The Sims, but than smaller. It takes some time and a lot of Simoleons, but eventually you can show off your crib in front of your friends. 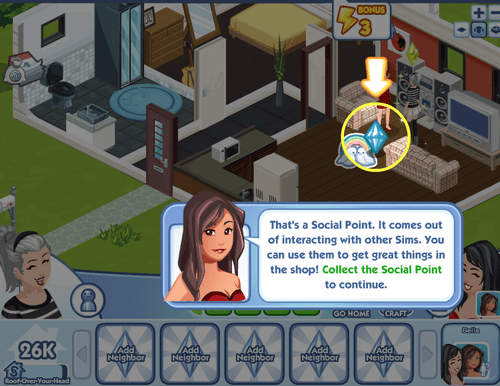 You may think: what has electrics to do with The Sims Social? Well, nothing. We are talkin gabout the energy of your Sim. At first I thought that you could refill this by making sure your Sim has a good mood. But that’s not how it is done, by achieving goals and talking to your neghbours you’ll get energy. But you will also lose it by doing this. You can also wait for 3 minutes, that is how long it takes to get one energypoint back. The higher your level is, the harder you assignments will be and the more things you need to do to finish the assignments. Unfortunately this means you cannot do the assignments in one time, and you need to ask your friends for energy and items. When your energy is running lower than 3, you’ll get a timer which says: Getting more energy after 3:00 minutes. It is really annoying to wait for energy, and I hope this will change. In the promo it looked like you could visit your neighbours, chat and really see each other’s Sim. Unfortunately, dit is not right, your Sim can visit a Facebook friend, but your friend will get a notice afterward. Personally, I think this is a really downfall because I hoped for a chat ability while you visited each other. Neighbours are really your saving angels in this game. The assignments you need to do, cannot be done on your own, like I already explained about the energy. When you finished a assignments you can share your rewards, so you can help your neighbours again by giving something. When you need an item for an assignments it is really easy to ask your friends, with a few clicks of the mouse your request is sent. Your Facebook friends will probably become annoyed after a few request, because a few will turn in a lot before you know it. But it’s not only taking, you can also give. Whenever you complete an assignment, or your Sims went a level up you will get an option to share your reward. Whenever your neighbour accepts the share, he or she will get a part of your loot. But when your Facebook friends did this, you can claim it as well! Whenever a friend of you upgraded their house and raises a level, it is possible for you to claim Simoleons! 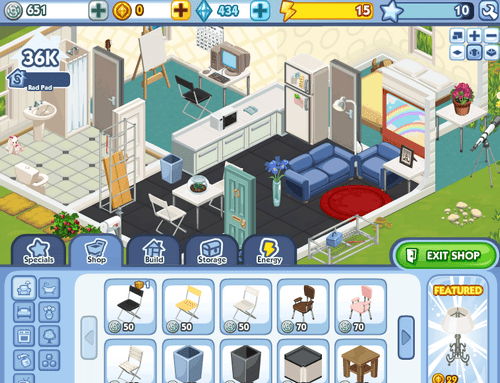 In this way you will get money, which you can use to upgrade your own house or Sim. The Sims Social really is a fun game! And really addictive as well! When you take a day or two to really play it you will come pretty far! 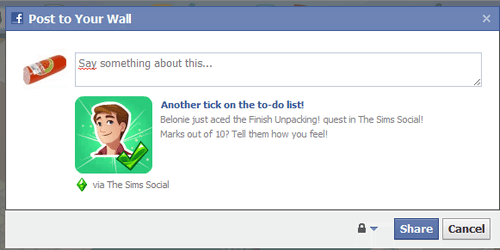 Normally I’m not a big fan of Facebook games and at first I wasn’t really excited about The Sims Social. But man it is so much fun! And really addictive… After playing this game a day or two, you’ll come really far in it. Usually I am not a big fan of Facebook games and at first I wasn’t really excited about the game. But this is really fun! All in all, it is really worth playing. When you don’t have a Facebookpage, and you’re not sure whether to create one to play the game? I would say: Give it a shot, and become addicted!